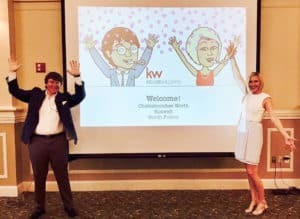 On Thursday, May 4th, Andy and I had the great pleasure of presenting the latest Metro Atlanta Real Estate Statistics to Keller Williams Roswell, Keller Williams North Atlanta, and Keller Williams Chattahoochee North agents at the Country Club of Roswell. As I poured over the 100+ slides of statistics for a week leading up to the presentation, it became apparent to me that as a real estate agent, it is our utmost duty to be the local “economist of choice” for you – – – our clients, family and friends. You all shouldn’t have to rely on the national news for your real estate updates. Heck, relying on the national news for the real estate forecast is like saying the average temps in the US today are 72. That’s why every single month (rain or shine), Andy and I share our perspective in our monthly newsletter about YOUR local market! I’m not going to bore you with my 20+ pages of preparation notes for the presentation, I’m just going to touch on the highlights of what we’re seeing in our current market! So, what’s NEWSWORTHY in Metro Atlanta Year Over Year? Overall, the Atlanta real estate market is great! Median sales prices are up! Sales to List Price ratios are up! Days on Market are down! Keller Williams still leads the Atlanta Real Estate Market! Although our real estate market appears HOT HOT HOT, 42% of homes require a price reduction to sell (across all price ranges). 50%+ of homes priced over $500,000 required a PRICE REDUCTION to sell! If you take a price reduction, you’ll only get 91% of your original list price on average and it will take 9x longer to sell. If you price your property correctly out of the gate, you’ll get 99.1% of the list price in 14 days on average. To sell, homes priced btw. $1m-1.5m have to compete and beat out 17 other active listings. To sell, homes priced over $1.5m have to compete and beat out 24 other active listings. The average number of homes (in all price ranges) that an active listing competes against is 3. So, competing against 17 and 24 homes, respectively, in the luxury price point is concerning. Multiple offers continue to drive up home prices. 26% of homes sold in the 1st Qtr 2017 received 100% or more of their original list price! I want you to want to read my blogs in the future! So, I’m not going to bring back memories of college statistics by boring you with more numbers. Let’s just get to the meat and potatoes of it! Sellers, you need a real estate expert to sell your home. Gone are the days of putting a sign in the yard with an agent that does real estate as a hobby and praying it sells (especially in the luxury market). Sellers, you need a real estate expert to price your home correctly so you will get the most amount of money in the least amount of time! Buyers, you need a real estate expert that understands what areas and price points you can expect multiple offers on a home and how to navigate that negotiation so you can WIN the house! We base our negotiation and pricing decisions on EVIDENCE, not emotion. We sell our listings for 99% of the list price in 16 days on the market on average. We’re getting 2.5% more for our listings than the average Atlanta agent and selling our listings in half the time. We’re passionate about understanding our clients’ needs and delivering an exceptional real estate experience. Looking to buy or sell, look no further than the experts at The Peters Company.